The late Paul Kara galvanized audiences with his remarkable feats of crystal gazing and mindreading. Yet for all of Kara's remarkable stage presence, staging, and costumes, audiences and critics alike said it was his answers that kept them coming back, night after night. 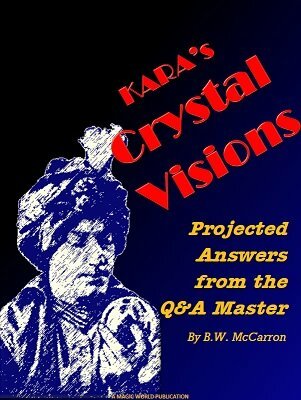 Now you can learn from the master with this amazing collection of over 300 of Kara's answers to questions, just as audiences would have received them back in his day. Not only that, but the questions themselves can be used for practice purposes, to hone your own answering abilities razor sharp! The ebook reveals how Kara doubled -- even quadrupled -- the press coverage for his week-long theater engagements. And it didn't cost him a dime! Learn, too, how Kara made money by giving away free answers to questions submitted by newspaper readers. As a special bonus, a reproduction of Kara's Book of Mystery horoscope pitch book is included. Original copies are nearly impossible to obtain at any price. 1st edition 2015, 92 pages. This eBook contains a wealth of interesting and sometimes challenging questions. It can provide superior practice material for a Q&A routine. If you ever wanted to reach out and connect with your audience, well considered answers can supply that bridge. People love to hear about themselves and to have a "parental" voice guide them through life's difficulties. While some of the answers Kara gives are rather confrontational by today's politically correct standards, most of his answers are sharp and insightful. I feel that I got a real bargain and actually use this material in rehearsal and practice.